The gardening season has now officially begun for me. When I closed my eyes to sleep the other night I saw weeds. Some insomniacs count sheep. I relax by visualizing vegetation I don’t like (e.g. dandelions) that is growing where I don’t want it (e.g. my lawn). For the past several weeks, as I cleared my perennial beds and the first signs of green life began appearing, my sleep has been somewhat restive – due in part to uncertainty about all those spots where I didn’t see signs of growth, and concern for the weather conditions that could destroy those sprouts that were beginning to emerge. But now that the evil invasives are back for me to do battle with – a one-shot operation with no “will they make it?” type of worries – I can once again rest peacefully. It isn’t just my own weeds that can generate these soporific perceptions in my mind however. This time it was the plethora of pervasive plant pests that percolated up from the depths of the Frank WestonRose Garden, and presented themselves for our gardening pleasure earlier in the day. 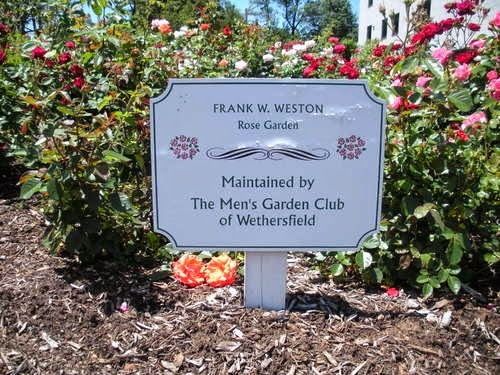 “Our” is the assemblage of plantsmen from the Men’s Garden Club of Wethersfield who had gathered earlier in the day to “open up” the town’s rose garden. 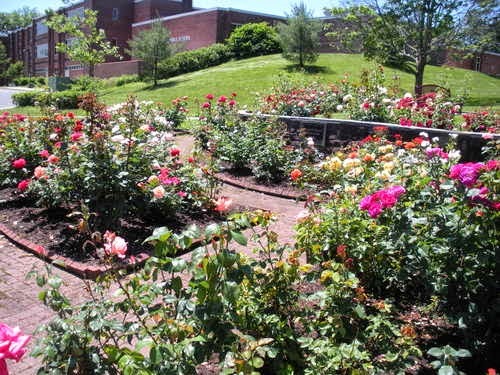 The MGCoW has been caring for this public recreational area since 1983. Rocco, Ernie, John, James, Prez Tony, and I arrived at 8:00 a.m. Club member Richard had previously done some of the work. Our tactical plan was to clean up winter debris; spread composted cow manure (which had frozen last autumn before we were able to “winter-over” with it); evaluate the rose bushes’ health and cold weather survival status; cut away some deadwood; and do a little incidental weeding. This last task turned out to be our major occupation for the morning. The abnormal cold and snow pattern of the past winter appears to have played havoc with the floribunda’s wellbeing – we will know more in a few weeks. But the strange weather clearly was a godsend for the unwanted groundcover vegetation (chickweed, etc.) that vies for space with the fragrant perennials for which this planting area is intended. This unexpected enemy was fine with me since I had passed up my usual Saturday morning at the health club for what I was hoping would be a comparable, but purposeful, workout. Part of which would consist of carrying the 40-pound bags of composted cow-patties, and strategically dumping that dung around the bases of the plants. And now the war of the weeds would complete my exercise program. Although somewhat taken by surprise, our band of “Rose Warriors” was nonetheless up to the challenge – using cultivators, shovels, and gloved hands to rip the unwanted miscreants from their wrongful places in “our” modest, man-made attempt at Eden. 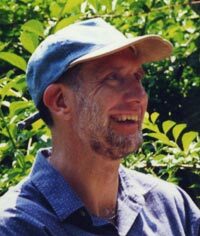 Unfortunately, being out of practice, I had not brought my all-time favorite garden tool – the fork-tongued weed remover. No gardening job is more rewarding to me than duck-walking along a weed-stricken piece of land and plunging that tool into the soil to undercut the culprit’s last earthly connection. So instead I ripped them out the old fashioned, manual way – with some improvised help from my pruning tool as up-rooter. The bending, kneeling, standing, lifting, twisting, stretching and tugging was a great complement to the aforementioned heavy lifting. I did however remember to bring my second favorite gardening toy, a Japanese pruning saw – which Rocco and Ernie discovered the joy of when they grappled with two patches of orna-monster grass which, uncut in the fall, had turned to stubborn, eye-high, vertical straw stacks over the winter. In the end it was time well spent and much fun – as evidenced by the resulting look of the garden, the fatigued feeling in our muscles, the collective sense of satisfaction, and the long-awaited images of unwanted plants that appeared to me when I settled into bed that evening. Plant growers in arid places like New Mexico, who struggle to cultivate anything floral, find it difficult to believe that I spend even more time and energy removing unwanted greenery than they do nurturing it – and that I get as much, and sometimes more, satisfaction out of acts of extermination than of those of germination. They may even question how I, an inveterate destroyer of plant life, dare to call myself a gardener.